Bicycling had a piece on cyclist’s palsy. “About one-quarter of all riders will develop cyclist’s palsy–pain, tingling, numbness and weakness in the hands, wrists or fingers–says Andrew Pruitt, a bike-fit and sports-medicine expert.” They go on to suggest adjusting bike fit and list some exercises to strength muscles. As one suffering from computer induced RSI tendinitis and as a person who enjoys cycling, I have faced a double whammy. When I had severe symptoms, I simply stopped biking and switched to hiking and running. Any time you stop using your hands, you let them heal. Same goes for carpal tunnel syndrome. I started using Ironman Elite cycling gloves because of their thick padding. These gloves work pretty well. 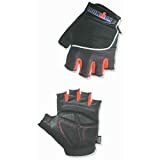 I also have the Ironman Elite mountain biking gloves but do not like them as much because of much less padding, even though they are full fingered. They make a newer Ironman Elite T.2 glove that also works for me. I installed a Stem Riser to make my road bikes handlebars higher. 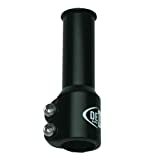 This allows more weight to stay on the saddle and off my handlebars. Keep in mind that you may have to install longer cables with a higher stem. Road biking is very hard on the hands and Cyclist’s palsy. I found that I could tolerate far more road riding using my mountain bike. Hey some riding is better than NO riding. Slow riding is better than NO riding. Our Road to recovery from carpal tunnel article helps list the steps we followed to beat Carpal Tunnel and hand pain. I bought these gloves and really like them. Much better than the Pearl Izumi’s I had before. Padding is real thick.